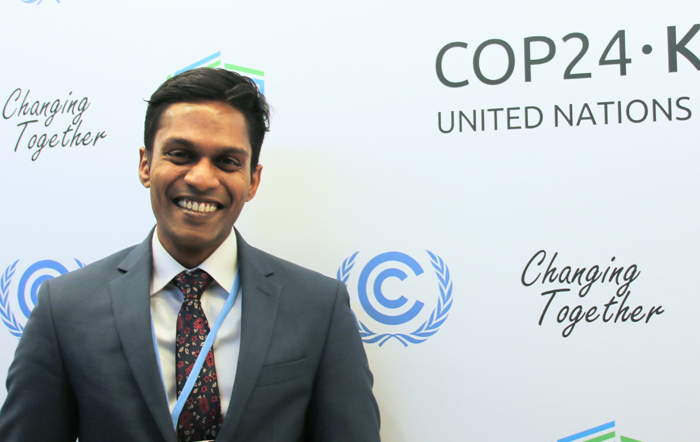 Congratulations to our alumnus Sujay Natson (MSc in Environmental Change and Management 2017-18) who was awarded a gold medal in a global essay competition at the Climate Law and Governance Day at COP24 in Katowice on 7 December 2018. Sujay wrote the winning essay for his ECM elective module ‘International Environmental Law’. You can now download and read his essay, "Using specific examples, discuss the development of climate litigation internationally". "Climate change litigations (CCL) are on the rise globally as a promising means to increase action on both climate change mitigation and adaptation efforts. Within developed countries, most CCLs launched by non-governmental organizations (NGO) tend to focus on mitigation. Whereas in developing countries, majority of CCLs tend to focus on adaptation efforts. There is an increasing trend in developed country CCLs to use rights-based arguments and they have shown to be relatively successful. For developing countries, as their main targets are developed countries and large fossil fuel companies most responsible for causing the detrimental climate change impacts they experience, the international legal framework is inadequate for using CCL. However, CCL can be used in other ways to achieve their aims. This paper focuses on how CCL has developed to increase action on mitigation and adaptation efforts internationally, highlighting the key arguments which have proven relatively successful in their application."